Fake Plastic's very own Fr. Jones shoots the breeze with Ian Williams of Battles about touring rituals, favorite loops, and the division between the electronic and organic. Here is the review of Battles' Gloss Drop. FR: Moogfest is right around the corner. Can you tell us a little more about how you got involved with this event? IW: We were asked to play, i believe. FR: In your humble opinion, who is the best artist featured at this event that not enough people know about? IW: I look forward to seeing the Stickmen, if it is in fact the same band that was from Philadelphia in the late seventies. FR: Connecting the festivals of the past year is your endless live circuit. Do you approach live Battles shows differently than festival performances? IW: The main difference to me is that your time is more abrreviated at a festival- so you have to rush through your set and can't expand as much. And also sometimes you can be really rushed just to set up in time and that can screw your show up if you're not able to be ready in time. I'd say sometimes it can be the fault of the artist or sometimes can be the fault of the festival when that happens. FR: I imagine touring can get draining. What is the most difficult part of the live circuit- and how do you cope? IW: It's hard the hardest thing i've tried, but also the most rewarding. It's a strange high, one that comes from a fucked up lifestyle, but a high that is hard to match doing other things. I try things like jogging and also touring with a bike in the bus. It makes you feel instantly local in each town. FR: Does the band have any pre-game rituals before going onstage? IW: Each of us is different. I like to stretch a bit and not be bombarded with socializing. IW: Ireland is pretty strong. Japan is too. Mexico is really good these days. In the US, I'd say the west is pretty great. FR: What are Battles’ main musical influences? Who are you guys listening to currently? IW: I don't think we wear our influences on our sleeves, but we do synthesize general aspects of a lot of music. Electronic and rock music. FR: Let’s talk Gloss Drop for a bit. I really dig it- I'm a big fan of “Futura”and I think “Sundome” is some of your best stuff. Outside of Tyondai Braxton’s absence, what was the biggest difference between Mirrored and Gloss Drop? IW: I think we've had a linear progress from the early EPs through to Mirrored then Gloss Drop. Our technique has been more honed and we've figured out how to take our musical language further. 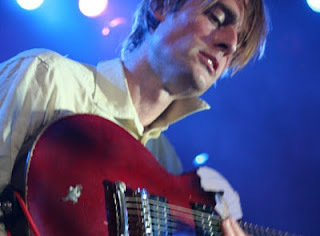 FR: Battles is known for their tight, precise, electronic sound as well as warm, organic instrumentation. Do you intentionally try to combine these elements? Do you hold allegiance to one over the other? IW: We don't make a division between the two worlds. The obvious joining happens when electronic sounds are put through amplifiers on stage. It gives some air to what could be a really tight electronic sound. It makes it more soupy. And also when you loop guitar lines, it does the Black Sabbath sounds like a disco song thing. FR: Out of all the looped soundscapes you’ve created, what is your current favorite? IW: I like all the loops on Gloss Drop. It's really the looping that evolved on this new record. New tricks that Dave and I used to make them. If i had to pick maybe i'd say "Futura" or "Wall Street". FR: Where do you see Battles and the music industry in the near to distant future? IW: While there's a question of how money will be made in the future, it still will be in demand. Society has always organized itself around music. But another interesting question is how is the huge catalogue of recorded music building up influences things. That is a new development- that the past fifty years of musical history have recorded and are still with us. Beatles records still sell like crazy. What that means for younger bands, i'm not sure. IW: Don't worry about being sucessful. Just make music that you like and if you genuinely achieve that, somebody else will like it too.